This past week Vancouver received our first real snow of the winter. While the downtown core didn’t get much of the white stuff on the ground the Fraser Valley was well blanketed. Before it all went away I was lucky enough to drive out to the valley and take a look. While I really appreciate living on the West Coast because we so seldom have to deal with extremes of weather, I feel an obligation as a Canadian to get out there and at least try to enjoy the snow once a year. Sometimes this means a drive up to a local mountain. Sometimes this means just sitting by the window and watching as the flakes drift down (and up…updrafts next to tall buildings are weird). My snow appreciation this week involved a bit of work clearing fallen branches, watching the ice the Fraser river and a local lake and appreciating the “foomp” noise as my work-boots broke through a 1.5 foot layer of virgin snow the yard. Making tracks in moderately deep snow is a pleasure I hope I never take for granted. The sound is great but the best part is the sight of the trail following me through the yard. Tracks in the snow can tell you a lot about the person or thing who left the tracks. Their shape, the distance between each track and the trails left by tails or coat-tails all tell a story. This week share my moment of inspiration. 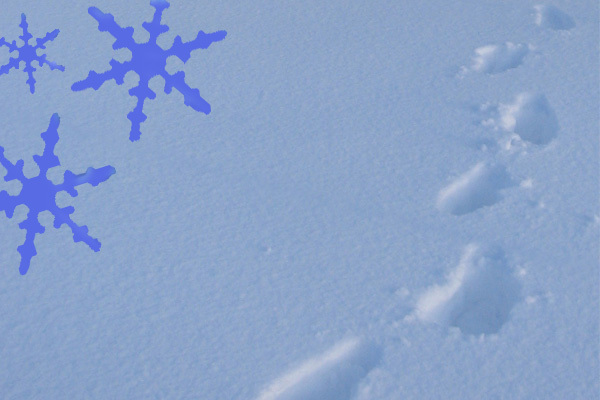 Tell the story of someone following tracks in the snow. Why are the tracks there? Why is your character following them? Who left the tracks and where will they lead? Aim to fill two pages with your snow story.